Leitech is a leading thread depth control manufacturer. Their measurement systems are able to simultaneously measure thread or cylindrical size and depth with exceptional ease. Coupled with direct reading depth scales, the convenience, and efficiency that Leitech systems is simply amazing. When you use gages manufactured by Leitech, you never have to worry about any errors associated with counting turns and depth steps. These common human errors are automatically with the said products. 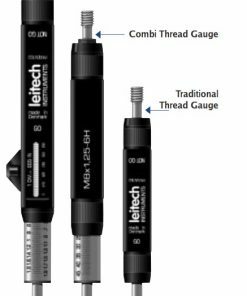 Whether you are shopping online for a Leitech thread depth gage to check length or qualify your minimum GO thread size, Willrich Precision can help. We are highly committed to helping our customers purchase stellar quality products that make calibration procedures easier for their operators. What’s more, the products you find in this range help cut inspection times by half! Our company has been in the business for many years, and we have been serving the gaging, inspection, and metrology industry since 1971. As we practice a client-first approach, you can be sure that you will get all the assistance you need with any purchase. What’s more, our repair services guarantee that maintaining your equipment in the future is no difficult task at all. Start browsing our stellar selection of Leitech gages today and shop with confidence!